Today, Patagonia rejected the politics and policies of Trump by using their $10 million tax rebate from the recent US tax reform to invest in a whole bunch of sustainability projects. Meanwhile, much of the rest of corporate America, simply enriched themselves and their executives. Now, we all know that corporate America received billions when Trump cut the corporate tax rate to 21% from 35%. We also know that this gift would trickle down to workers and communities through business investments. I jest. Instead of that happening, companies have shattered corporate share buy back records and in the process further enriched the shareholding class. According to Forbes, S&P 500 company buybacks to June 30 were $370 billion of a board authorized $1 trillion in buybacks for the year. That’s around $7,000 for every one of America’s 155 million workers. 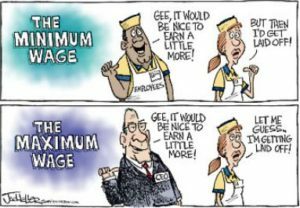 It’s also 33% of the 60 million minimum wage earners’ annual salary. Trump et al expected the tax cuts to boost wage and economic security through improved productivity and competitiveness leading to a more robust economy. Exactly how and when this was to happen? No one really knows because it has never happened in the 30 plus years the trickle down concept has been around. But we do know why it’s not happening : companies prefer buy backs over capital investments. During the first half of this year, major US companies said they would make $317 billion in productive investments, most planned in 2017 before the tax cut. Apple, for example, said it would raise research and development investment to $14 billion as a result of the tax cut, adding another $30 billion over the next five years. By contrast, the tech giant had already repurchased $43.5 billion in stock and plans to buyback another $100 billion more! This is not the first time ‘trickle’ economics down didn’t work. Remember the Bush tax incentive to get companies to repatriate overseas investments? It worked. Lots of money flowed back to the USA…. and straight into buybacks. Why are Buybacks Popular with Senior Executives? Why do executives just love buybacks? Arithmetic tells you that the smaller the number of outstanding shares of a company, the more earnings per share shareholder get: the more you own, the more you make. So, while the average Fortune 500 senior executive is only makes $250,000 a year, their stock dividends and/ or sales can yield ten, even twenty times more. But What about all those Worker Bonuses!? You may remember that a few companies – 413 to be exact – gave modest, one-time only bonuses to workers. After that? Don’t hold your breath for new bonus in 2019. There are over 4,000 US companies with revenues over $1 billion. 4%, or 6.8 million American workers got a one-time-bonus and/or a wage hike tied to the business tax cuts. 413 businesses provided workers bonuses tied to tax cuts. Corporations got 11 times as much in tax cuts as they gave to workers in time bonuses and wage hikes. 10% of corporate shareholders own 84% of all stocks. 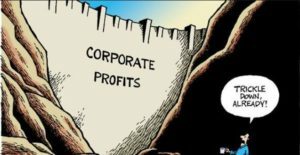 Companies singled out for not passing along tax gains to the folks that make up their ‘team’: ExxonMobil, UnitedHealth Group, General Motors, Ford, Amazon, General Electric, Walgreens, Chevron, Boeing, Microsoft, Citigroup, IBM, Target, Aetna and UPS. Some companies, like General Motors, are not just not investing their tax savings in people or productivity, they are shedding jobs. It’s not fair to point out GM, but I will anyways. Anticipating weaker growth, they say they will chop 15,000 jobs in March 2019. Now, some may think this is responsible management. And it may be. But why is no other car company making this move? Does GM know something the rest don’t? To this I juxtapose four facts: cutting production, recent huge tax rebate, no other car company is cutting production, and looming auto sector contract negotiations (and let’s not get started on the massive bail out of 2009). Some people say the auto industry colludes to abuse labor. Not me, I am neither a cynic nor into conspiracies, so I wont say it. A lot of fortune 500 companies have been lauded for commitments to workers, communities, and the environment. Trump’s Enrich Corporate America Again tax rebate has fueled buy backs outpaces by far corporate investments in things sustainable. Patagonia’s modest tax refund investment maybe symbolic given the existential climate change, poverty, and immigration threats at hand, but its decision surely put the rest of corporate America to shame.